Abortionist-turned-drug-dealer Howard J. Levine lost his Washington state medical license after a decade of legal charges and prison sentences. In the 1990's he ran an abortion business, but his practice was plagued by botched abortions and patient complaints. After seven former patients testified against him, the state of WA suspended Levine's license and prohibited him from ever performing abortions. Patients detailed a host of complaints: Levine was demeaning and verbally abusive to patients, failed to wear gloves during at least one abortion, and was physically rough with patients. 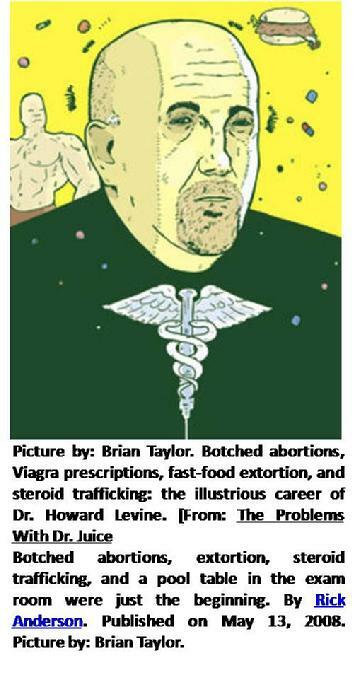 The crowning complaints involved women who required medical care when Levine botched their abortions. "Patient E" had fetal remains in her uterus, and was forced to obtain a second abortion. "Patient C" presented to the hospital with a fever and vaginal infection requiring antibiotics. The horror stories continued. Abortion "Patient B" required emergency exploratory surgery, in which it was discovered that Levine had perforated her uterus and caused small bowel necrosis with mesenteric laceration. "Patient A" nearly died. Court documents record that Levine botched her abortion so severely, "Patient A" suffered a perforated uterus, and organ death (necrosis) of her ovaries, fallopian tubes, and part of her small intestine. Her peritoneal cavity was so full of pus that the appendix had adhered to the area. Doctors had to remove "Patient A's" uterus, fallopian tubes, ovaries, appendix, and a portion of her bowels to save her life. 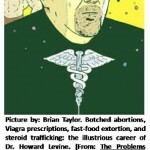 Prohibited by the WA medical board from performing abortions, Howard Levine turned to illegal drug sales. In 1999, after a divorce, he "reinvented himself" as the flamboyantly gay "Dr. Viagra," dispensing the pills online to unverified clients. Arrests and prison sentences followed. 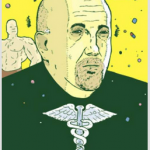 He was sued for selling Viagra online to an underage minor, and charged with hawking illegal steroids to clients and drug dealers at Starbucks. Levine was busted in a DEA investigation on June 17, 2007, when his son called police after finding his father suicidal at home, strung out on meth and a cocktail of other drugs. The WA medical board gave Levine numerous chances to retain his license, perhaps taking into account his psychiatrist's diagnosis of bipolar disorder. 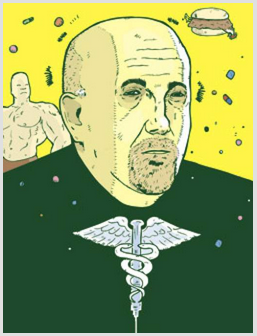 But Levine persisted in flouting the law, engaging in illegal steroid trafficking. Levine's house of cards came tumbling down in August 2006 when a SWAT team raided his house and he was arrested. Incredibly, his medical license was still not revoked. In 2007, Levine was rearrested in 2007 and indicted on drug charges, and his license was again suspended. In 2009, the hammer dropped. The long-suffering WA Dept of Health permanently revoked Levine's medical license, with no possibility of reinstatement. In a 16-page Order, the State outlined the charges against Levine: a pattern of illegal conduct, incompetent medical practice, federal convictions for distribution of controlled substances and wire fraud, failure to pay fines, failure to comply with previous agreed orders, and positive tests for use of controlled substances. 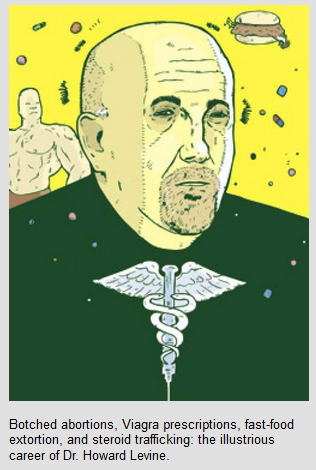 Concluding that Levine could "never be rehabilitated," the State of WA permanently revoked Howard J. Levine's medical license, effective April 20, 2009. It was perhaps a case of too little, too late, but a decade after seven women testified against Levine's rough, demeaning, and botched abortions, Dr. Viagra met his professional demise. See botched abortion info on pages 1 and 3.